Macadamia oil for hair. Why and how does it work? Vegetable oils are limitless source of natural ingredients we use everyday. Many of them we add to meals and use in cooking in general, but more and more often oil can be found also in our bathrooms. Below we will discuss one of those oils, i.e. macadamia oil. What are properties of macadamia oil? How does it work? High content of palmitoleic acid (colloquially called omega-7) makes macadamia oil the only known oil with such a great absorption by skin and hair. It is being absorbed immediately and for that reason is called vanishing oil. That quality makes this oil perfect for hair oil treatment, because it does not settles on hair and does not mess everything around, like the pillow you sleep on. 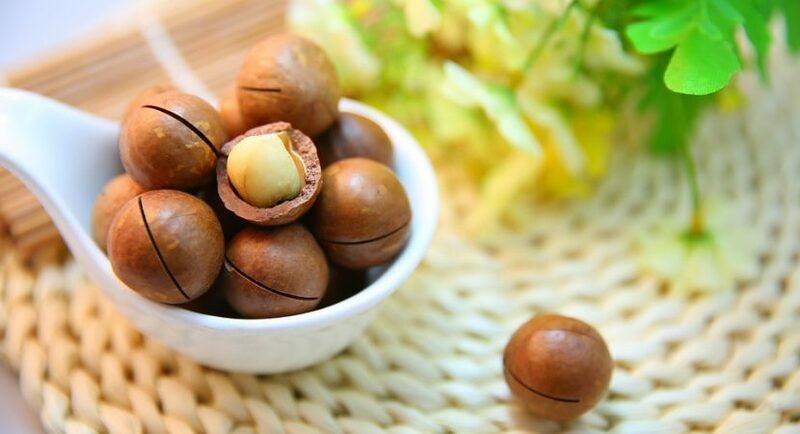 Besides, omega-7 is main ingredient of sebum produced in follicles, that is why macadamia oil is great for hair. Cooperation between macadamia oil and sebum results with strengthening and nourishment of hair from their roots. On top of that, macadmia oil has an ability to moisturise hair on the inside, where it gets easily because of its formula. It is perfect oil for dry, brittle and rough hair. Even small amount of macadamia oil covers follicles and prevents water loss. It may come as a surprise that at the same time macadamia oil speeds up drying time. There is one reason for it. Macadamia oil not only retains right level of water in hair, but also repel redundant water particles. Then hair dry much faster. Macadamia oil is great as a conditioner, perfectly moisturises, speeds up drying time, but that is not all. Very curious action of macadmia oil is its beneficial impact on hair during colourisation. How does it work? Before colourisation you need to apply small amount of macadamia oil on hair and scalp then perform the treatment. Oil will fulfil role of enhancer for colouring product – it will make easier absorption of colourant by hair, enhance gloss and effect will be more intense and durable. Makadamia oil – the best elixir for your hair Copyright © 2019.